Flying Lancaster based at Elsham Wolds. Ronald Thomas the rear gunner of the Lancaster PM-M and killed when he was hit in the chest with 20mm Cannon from a night fighter. My Friend Jack Spark was the Wireless Op who was sent to report on damage after the attack & he found Bob, I believe they has called him in his turret. The whole story was the subject of an article in Fly Past a Year or Two back. In this Raid Jack Received a DFM for saving the Lancaster, During the raid he had seen a night fighter cone by searchlights fire of a series of flares. Later in the raid when they were coned he fired of the same series & the searchlights went out. Jack who is still with us Contacted the crew of the fortress they had wrecked & found out the American radio Op & pilot were the only survivor of a later shoot down. This Radio Operator George Silva, Jack & myself continue to talk via the internet Video link most evenings. The full story of the Lancaster PM-M & the Passionate Witch Fortress crews was fully detailed in a book Eight Airforce Bomber Stories. by Ian MClachlan. Both had a very rough war but with a lot of funny parts they are both happy to recall. George Silva I know was in Stalag 17b & he took part in the horrendous forced march from this camp. 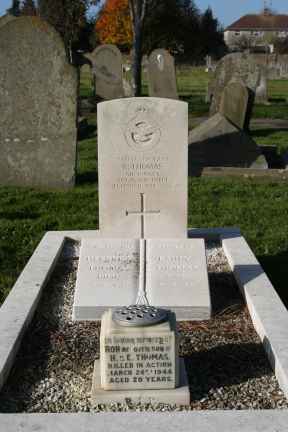 Rear Gunner Sgt Ronald Thomas was killed on board Lancaster ND572 PM-M on mission to Berlin when a German night fighter had opened fire. Bomber known to have reached England again, but was damaged in fast landing at Dunsfold: port wheel collapsed and plane collided with a USAAF B-17 there. However, it was repaired, only to be lost in a mid-air collision on 2 Mar 45. Crew were: F/S F. Brownings, F/S A. Richardson, P/O R. Walker, F/S J. Spark, P/O N. Barker, Sgt K. Smart (all safe) and Sgt R. Thomas (KIA).